I was driving home after work yesterday and decided that, before the "crap-ton" of snow descended upon Raleigh, NC, I wanted to make a pit stop to get some reading materials to ward off any boredom from being home all day. According to my handy conversion chart, "one crap-ton" of snow in the south = 1 inch. We got around 5-6 crap-tons today, which is a lot for us, and causes the city to shut down. 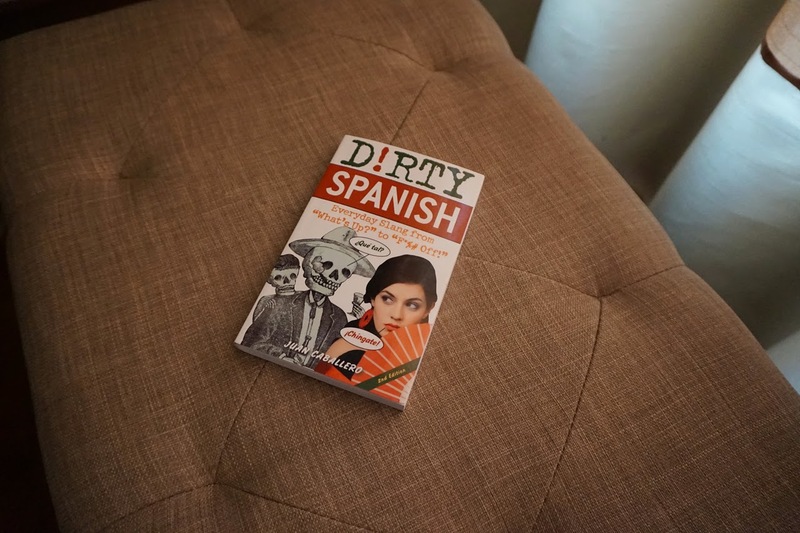 Since I want to be a well-rounded speaker of Spanish, I felt that this book was a necessary addition to my study materials. I'm lying; I just bought the book because it made me laugh. Just so you know, though, there are more than just dirty words and insults in the book; there are also common slang phrases. You never know when you will need to use some of this stuff in emergency situations. For instance, you never know when a situation will require you to call someone a "skank" (una macarra). I don't think my teacher would like a beginner learning slang since she's trying to teach us the proper way to speak. 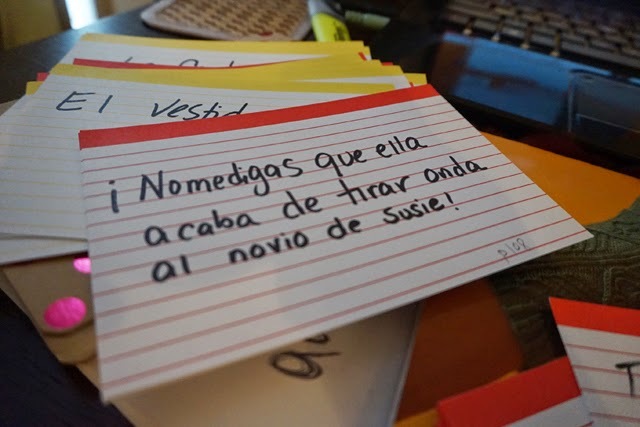 But I have made flash cards of some of the phrases from the book that make me laugh. I'll keep these separate from the other cards. The book says this says, "Oh no she didn't! She did not just try to mac on Susie's boyfriend!". 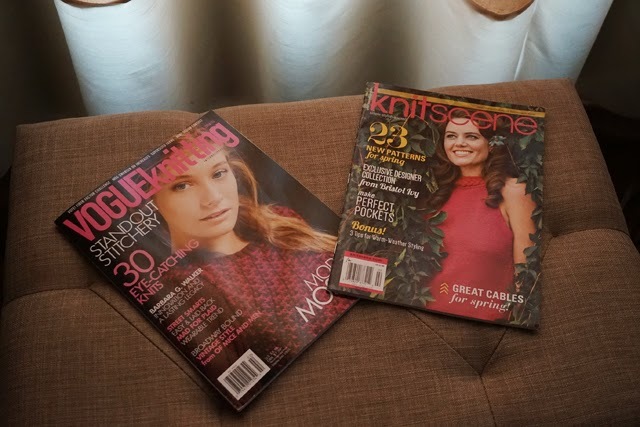 What would a knitter's snow day be without knitting? 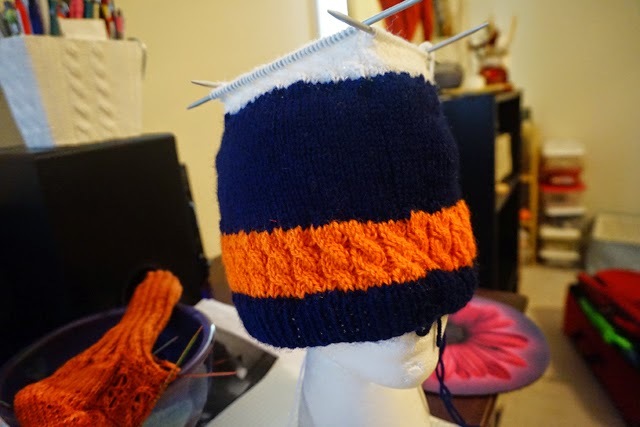 I have also been working on finishing this Chicago Bears hat for a friend. You can't see it very well, but that white section has cables like the orange section. I plan to finish this today, since I only have to close the crown. 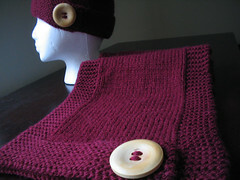 Thanks for checking out my latest project, I'm so happy the sweater fit the cute little baby! Wow, what a Winter! Thank goodness it's warming up now. 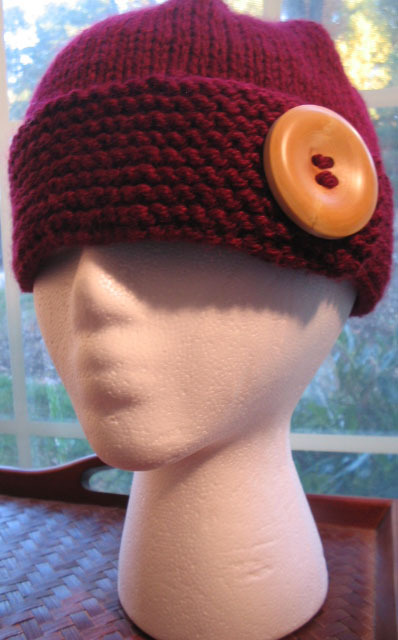 Love the hat, and oh, your Spanish dictionary is too funny! Good luck and thanks, I never thought about a Meet-up to learn Spanish. I'll have to look into that here in my town!